Since August last year, the Coalition Against Trafficking in Women – Asia Pacific (CATW-AP) has been in partnership with Voice in the Philippines and another grassroots organisation, SENTRO (Sentro ng mga Nagkakaisa at Progresibong Manggagawa/ Center of United and Progressive Workers) to implement a project titled: Violence Against Women and the War on Drugs. This is a response to the rapidly shrinking space for human rights advocacy in the Philippines, which has also been observed by the Civicus Monitor. The Philippine government’s “war on drugs” has claimed the lives of at least 4,075 people according to official government data, with other estimates reaching as high as 20,000. Initial responses from civil society were comparatively muted and dismissed as merely opposition propaganda. Human rights were being questioned, while advocates were discredited as valuing the lives of “criminals” rather than their “victims”. CATW-AP started the project with research on the profiles of victims and perpetrators in the extra-judicial killings (EJKs) related to the “war on drugs”. The organisation embarked on psychological first aid and empowerment trainings with the women who were left behind by the victims of the state killings. Their children also went through psychological first aid with child counselors. 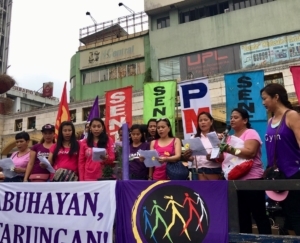 The widows, mothers, daughters, and sisters of the victims expressed that they found allies in CATW-AP, after experiencing feelings of isolation, grief and trauma, caused by the stigma and violence of being killed and tagged as “drug peddlers.” It was wrongly perceived that the EJKs were justified with expressions of support to the families branded as abetting criminality. Community members, neighbours, and some relatives commonly shared these sentiments, leaving the women further left behind. The empowerment trainings included human rights education. The women found this useful as police operations, which included arrests, searches and killings, continued in their communities. The women started questioning imprisonment of relatives and have been attending to cases personally. The project linked women to more organisations providing skills on self-organising, forensic photography and para-counseling. They were able to draw deep within themselves the strength to face the continuing threats with support from CATW-AP and SENTRO. 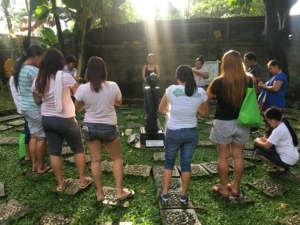 Through this process at least 112 women in three areas in Metro Manila formed the Organisasyon ng mga Kababaihang Survivors (Organisation of Women Survivors or OKS). The women were able to roll-out the education sessions to more than 210 women in three areas, thus far, by being facilitators themselves. From self-identified victims, they became organisers and mobilisers taking to the street, using their voice to make noise.